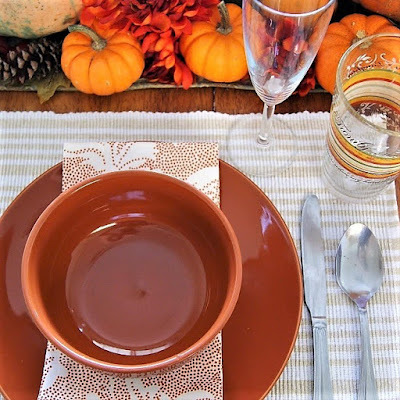 Fall decor doesn't have to be traditional. You can make it fun and cheery or elegant and feminine if you add an extra color to your fall palette. I get inspired by northern fall foliage on the east coast - so many different shades of red, orange, and bright yellow displayed on the turning leaves. Here are three colorful fall palettes to inspire your seasonal decor. 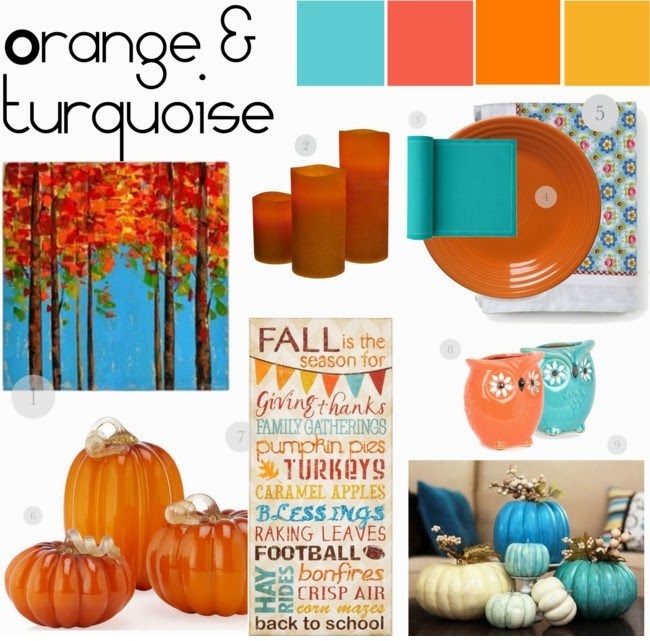 If your current decor includes a color that isn't traditional for fall, like turquoise, you can still use traditional pumpkins in your fall decor. As you can see above, turquoise and orange compliment each other very well. The trick to making this fall color combination work is to find one statement piece, like the wall art above, which incorporates both main colors. Then simply intersperse the colors throughout your decor. Add in yellow and salmon for a whimsical fall look. Aubergine is a top color in the fashion world this fall, but I also love it for home decor. 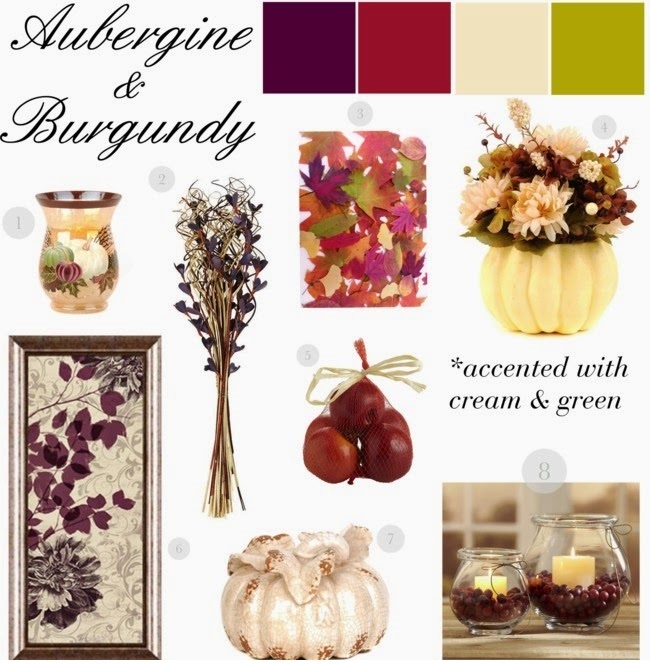 It lends itself to such a rich and elegant autumn color scheme, especially when paired with burgundy. Pair it with neutrals like cream and brown, and add apple green if you want a bright punch of color in the mix. Shades of brown are my favorite when it comes to a fall color scheme, because I love to include natural and rustic elements into my design. 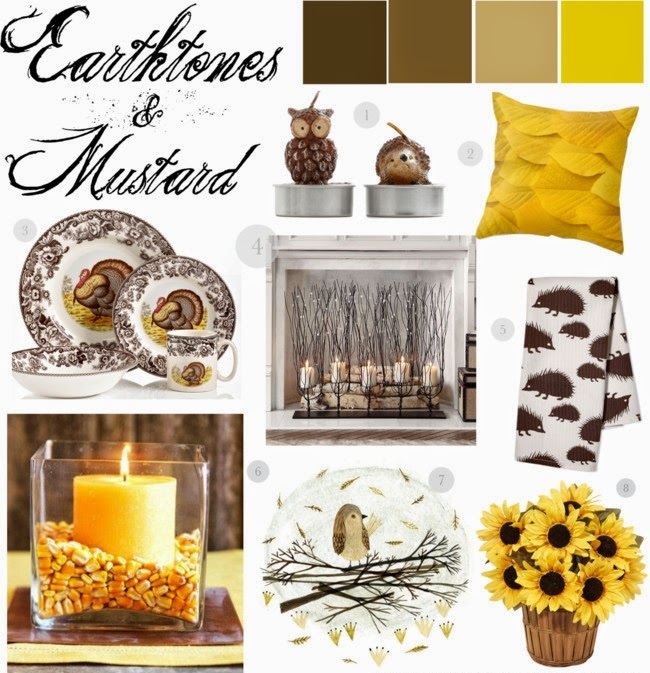 To brighten up a neutral brown look; add in mustard yellow with candles, sunflowers or mums, and dried corn. I love the fall centerpiece above made with a large clear candle holder with dried yellow corn. Make one large one for an entryway table, or line up three smaller ones in the center of your fall table. Which one of these color combinations would you pick, and what is your typical color scheme for Fall? Let me know in the comments below! I'd probably be more inclined to go for earthtones. Yellow is my favorite color, but in this case, I'd probably go with orange and turquoise. I do like the blues with the pumpkins too. It's a great update on the traditional orange for fall! Colorful home decor accessories are available in different designs and color for beautiful home. 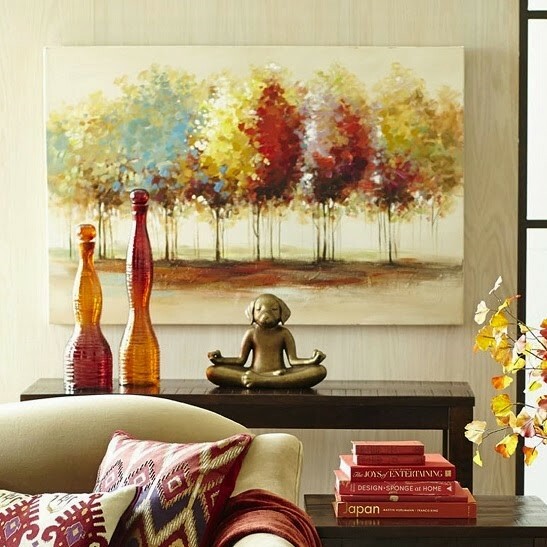 Colorful fall palettes are also best option for home décor. These are also available in different colors. You can purchase on online shopping portal.